Summer is on its way in my part of the world, bringing with it warm days, still-cool evenings, and life bursting out in the vegetable patch. It’s the most marvellous time of year to be in the garden, where every small effort of planting and watering brings excellent returns at the table in the form of sweet salad leaves, fresh herbs and tiny new vegetables. I made a punch with blood orange juice and mint on the first really hot afternoon of the season last weekend. Blood oranges are only available for a short season and they have a distinctive flavour, like a normal orange but with a sweet and delicate twist, plus deep ruby flesh and juice. 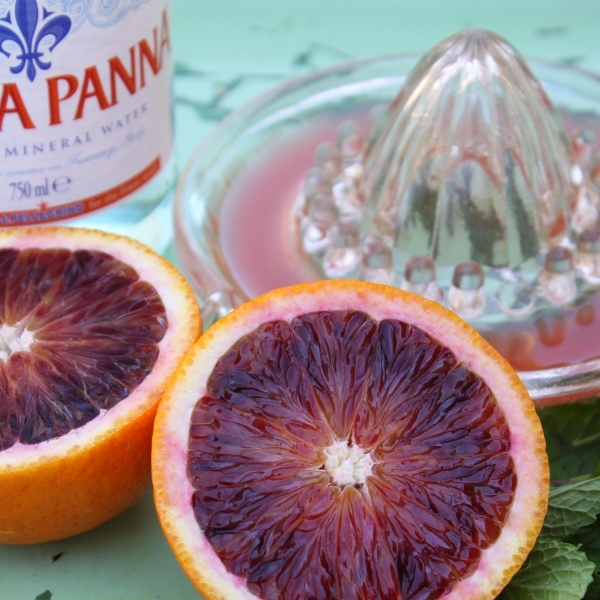 You could make this punch with normal orange juice, or even lime juice, but the colour of the blood orange juice has no substitute. First make a sugar syrup. In a small saucepan combine the sugar, water and vanilla bean. Bring to the boil over a high heat and simmer for 3 minutes. Remove from the heat and chill until you are ready to make the punch. Juice the oranges and combine with the juice, mineral water and mint leaves in a large jug filled with ice. Leave the vanilla bean in as it looks wonderful and continues to impart its deicate flavour and aroma. Serve immediately in tall glasses. Best drunk sitting in garden in the cool of the afternoon, with someone you love.